Czech and Slovak immigrants first settled in the Lower East Side of Manhattan and by the 1870s were firmly established as a community around Tompkins Square. With them they brought the vocations they had learned at home; but most, by far, were familiar with cigar making. Even those new residents who sought other types of work often ended up in the tobacco trade and many of the women and children made cigars in their homes as piecework. By the 1880s the Yorkville area was attracting German, Hungarian, Czech, Slovak and other immigrants. Conditions in the Lower East Side were increasingly crowded. For the Czechs and Slovaks, the northern area not only offered better housing, it was nearer to the cigar factories. 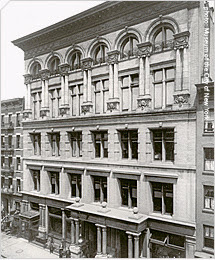 The tradition of social clubs for the various ethnic groups was well established in the Lower East Side and the Czechs and Slovaks had theirs: the National Hall on East 5th Street. Here socializing, political rallies, sports club meetings, and other functions were held. As the population shifted to Yorkville, another hall was necessary. More than fifty organizations pooled money to erect a new, impressive structure. Fundraising efforts began in 1892, including a concert led by Antonin Dvorak that same year. Construction would begin three years later. Architect William C. Frohne produced a dazzling Renaissance Revival style hall of beige Roman brick, terra cotta and stone. An impressive porch supported by paired granite columns vied for attention with a series of two-story arches, also supported by paired columns, below the cornice. The Narodni Budova, or National Hall, was opened in 1896; but Frohne was called back the following year to enlarge it, extending the building 25 feet eastward. The resulting structure, costing over $200,000, included a restaurant, bar, shooting range, bowling alley, various club rooms and, most popular of all, the ballroom-theater. The ballroom was designed to hold up to 800 guests and saw weddings and receptions, theater productions and dances. It was here on December 19, 1901 that famed violinist Jan Kubelik brought his audience to tears when he played the Bohemian National Anthem on his Stradivarius. While the women still worked mainly in the cigar factories, the men had finally been able to diversify. The East 67th Street Police Station had several Bohemian policemen and the 67th Street Post Office employed several Bohemian letter carriers and clerks. The financial success of the ballroom/theater was evident on November 29, 1921 when a gang of four robbers broke into the building and bound and gagged the 60 year-old watchman, Antone Skrevanek. The thieves made off with $2000 in cash and $1000 in Liberty bonds. With the advent of World War I the Bohemian National Hall became a focal point for nationalist meetings. Here ninety representative Slovaks met as a Congress of the Slovak League of America in 1918. Their purpose was twofold: to help America and its allies win the war in Europe, and to establish an independent homeland, free from the Austro-Hungarian Empire. The building continued as the central point of the Czech and Slavic community until mid-century. Then, after World War II and like many other ethnic neighborhoods, the sense of community dissipated as younger generations moved on and the older residents died off. With fewer groups using the space, funds for maintenance were scarce. 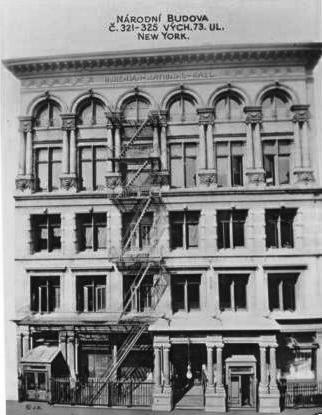 For the first time in its history the Bohemian National Hall was leased out to outside groups, including the Manhattan Theatre Club. Among one of the young stars to appear here was Liza Minelli. As the Hall became shabbier, the Manhattan Theatre club offered to purchase it. Negotiations faltered, however, ending in a lawsuit that dragged on for several years. In the meantime, the Czechs sought other organizations who might lease the building; however infighting among the various managing organizations prevented any headway. While the lawsuit went on and the Czechs fought among themselves, the once-proud Bohemian National Hall deteriorated. Finally, in 1986 the Department of Buildings declared it unfit for occupancy. It seemed to be the end of the road for the noble structure. Liza Minelli came to look at the old theater where she had performed years ago. She asked to see her former dressing room and, when she saw the condition of the building, she broke into tears. It was the Czech Republic who stepped in to save the building. On December 7, 2001 it purchased the Hall for $1.00, taking over the responsibilities of restoration and maintenance. The Republic gave one floor to the Czech groups for their use and began plans to use the rest for governmental purposes. The condition of the building was so degraded that little could be saved. $10 million was budgeted for the restoration and renovation to designs by Czech-American architect Martin Holub. A Czech firm, PSJ Holding, and an American contractor, Vanguard Construction, worked jointly in the project. Jan Hird Pokorny prepared the plans for the exterior restoration. Holub lavished his attention on the ballroom/theater. The heart of the old Bohemian National Hall, this was the one room that demanded restoration. The painted stage curtain was reproduced, only real plaster moldings were used, and hand painted woodwork, travertine and hardwood floorings were all imported from the Czech Republic. Having sat empty for four decades, the renovated Bohemian National Hall was reopened in October 2008. By now the cost had escalated to $45 million. The dazzling space not only houses the offices of the Czech Consulate General and the Czech Center, it now includes a 70-seat theater, library, and an upscale restaurant and lounge. The Bohemian Benevolent and Literary Association shares space in the building as well. Plucked from the edge of certain destruction, the grand Renaissance Revival hall survives as a living reminder of New York’s rich ethnic heritage.